All across the Caribbean, hundreds of major events are held each year. These events include colorful carnivals and a range of festivals focusing on art, music, food, rum, film, sports, etc. which showcase the Caribbean region’s rich culture and heritage. One of the more popular carnivals is the Antigua Carnival which has been held for over sixty years and brands itself as the Caribbean’s Greatest Summer Festival. Antigua Carnival has been held annually since 1957. Before this, a one day carnival was organized in 1953 to commemorate the Coronation of Queen Elizabeth II. Before then, as on most Caribbean islands, there was a Christmas festival that was celebrated annually and had many of the carnival elements including a parade with iron bands and masqueraders. Levering the history and experience from the Christmas festival, the first Antigua Carnival was held in 1957 to help attract tourists during the summer months which is traditionally low season. Another primary reason for having Antigua Carnival during the summer is to commemorate the emancipation of slavery. Slavery was abolished in Antigua & Barbuda on August 1st, 1834 and during that time, thousands of newly freed slaves took to the streets of the capital city of St. John’s to celebrate their freedom. 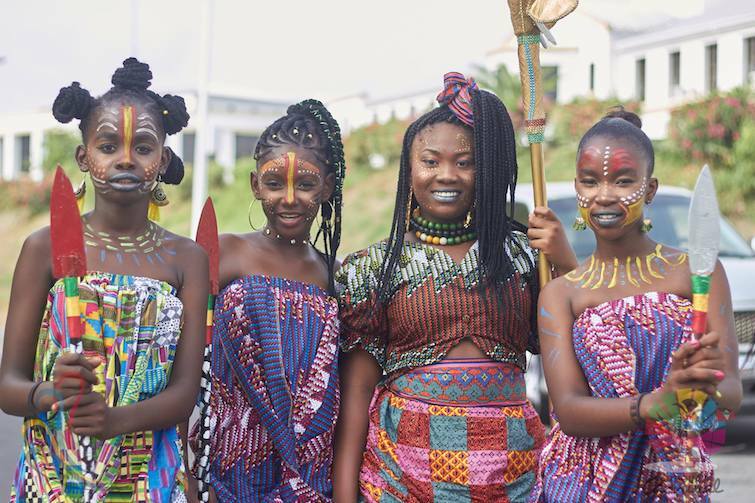 Four young women paying tribute to their African forefathers as part of Antigua Carnival. Photo Credit: © Antigua Barbuda Festival Commission. Antigua Carnival which has been held for over 60 years is one of the oldest summer festivals in the Caribbean and its creative display of culture, music, revelry, and mas is showcased in their logo. In fact, there are four key elements to look out for in the Antigua Carnival logo. Specifically revelry, music, culture and the general spirit of Antigua & Barbuda. * Revelry is symbolized by the Carnival Man dancing on one foot and swaying to the right. * Music is symbolized by the steel pan around his waist. * Culture is expressed by the dynamic and festive colors in the back and headpieces of the costume. 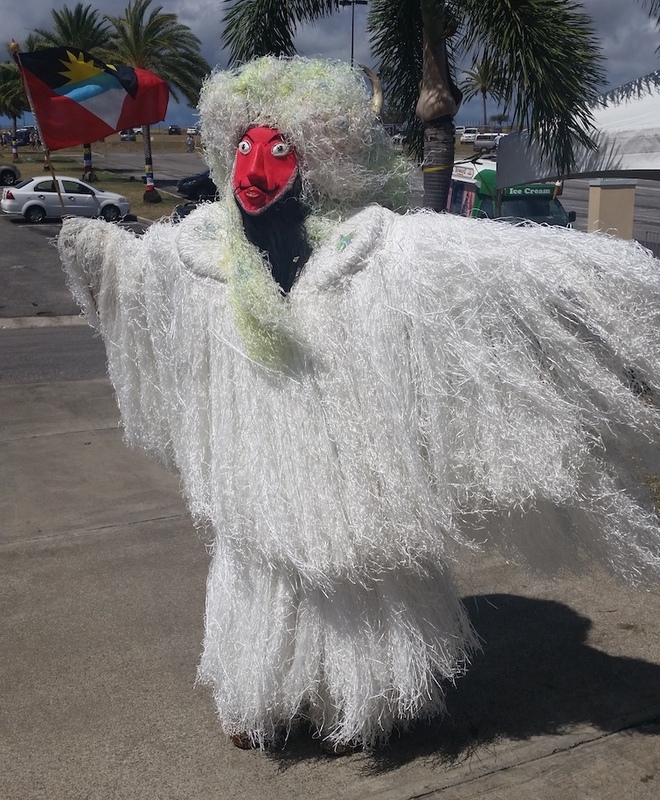 * The Spirit of Antigua and Barbuda is symbolized by the figure carrying the Antigua and Barbudan flag. Antigua Carnival logo and an Antiguan man were a headpiece depicting the logo. Photo Credit: © Antigua Barbuda Festival Commission. Antigua Carnival is traditionally held at the end of July to the first Tuesday in August. From its humble beginnings, it is now a 13-day affair with a wide range of events for all age groups including competitions and parades. 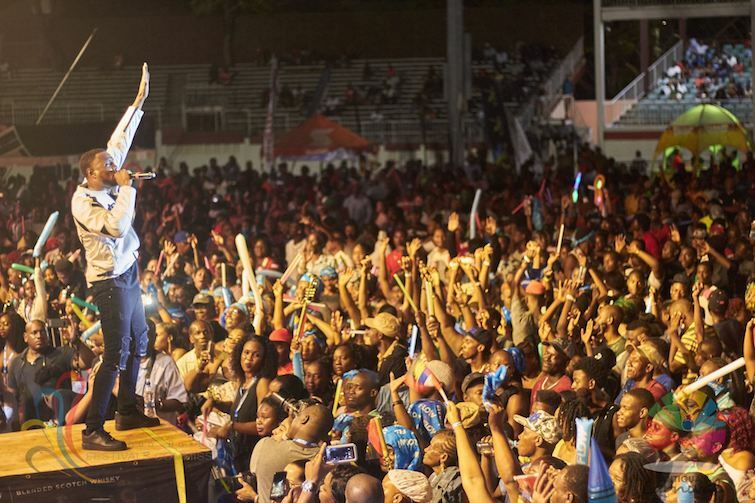 The 2019 dates for Antigua Carnival are Thursday, July 25th to Tuesday, August 6th with most events taking place at the Antigua Recreation Ground on Factory Road in St. John’s. 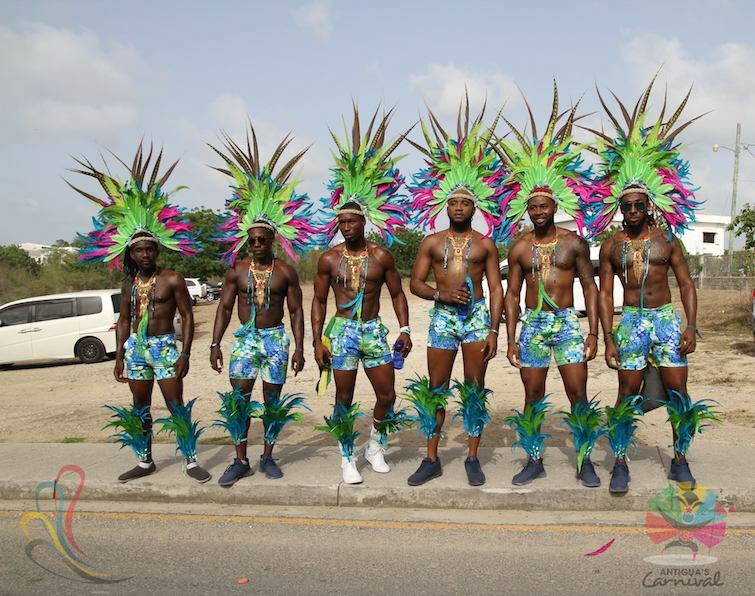 Besides the local population, Antigua Carnival is particularly attractive to Antiguan and Barbudan nationals living abroad as well as regional and international visitors who have a passion or interest in culture and Carnival-style events and festivals. In fact, Antigua Carnival attracts visitors mainly from other Caribbean islands plus the United States, Canada, and Europe. At some shows/events, attendance can soar as high as 15,000 participants and for the road parades as much as 18,000 participants. Children are always a key part of the Antigua Carnival celebrations. Photo Credit: © Antigua Barbuda Festival Commission. Antigua Carnival events can be broken down into three main categories: pageants, music (calypso, soca, steel pan) concerts/competitions and parades. Cultural dancers at Antigua Carnival celebrations. Photo Credit: © Antigua Barbuda Festival Commission. Many of the leading events at Antigua Carnival showcase both steel pan and calypso which is a staple in the Antigua & Barbuda music industry. Calypso which started in Trinidad can be traced back to West African Kaiso, and canboulay music is often laced with social and political commentary. Antigua Carnival: Tian Winter’s winning performance in the 2018 Party Monarch Competition. Photo Credit: © Antigua Barbuda Festival Commission. The events detailed above are just the official events for Antigua Carnival. There are many more parties and fetes for Antigua Carnival which can make the whole experience overwhelming. Thus for someone attending for the first time, here are what should be on your must see/experience list: T-Shirt Mas, Caribbean Melting Pot, Panorama Competition, Party Monarch Competition, J’ouvert, Carnival Monday and Parade of the Bands (Carnival Tuesday). These events take place towards the end of the festival and so are great for those who can’t commit to the full 13-day Antigua Carnival experience. 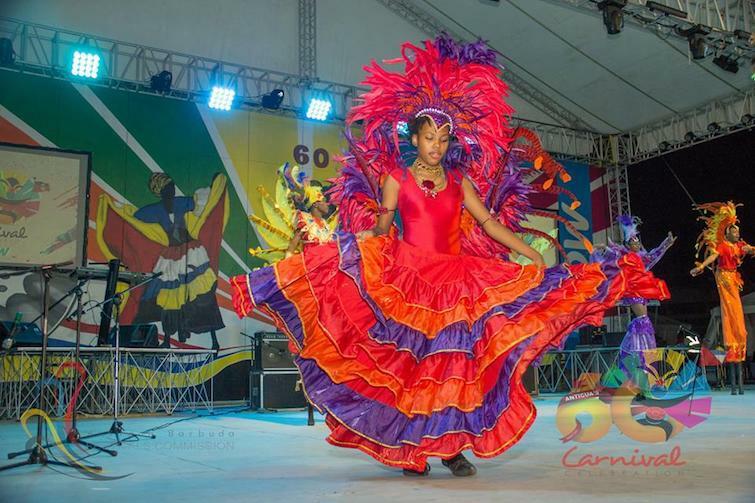 For ticketed Antigua Carnival events including the pageants, concerts, and competition, the leading retail outlets are located at the Antigua Recreation Grounds and the Office of the National Festivals Commission during the Carnival Season. You can also purchase your tickets online via the Ticketing App. Antigua Carnival: Tuesday Mas Queen of the Band (Myst Carnival). Photo Credit: © Antigua Barbuda Festival Commission. 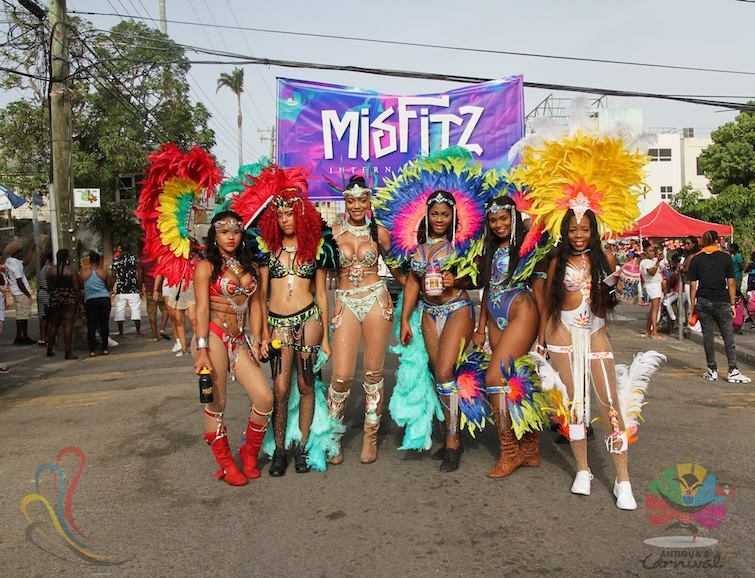 Antigua Carnival is not just a spectator event; visitors can take part in most of the parades via one of the mas bands including Beautiful People, Myst Carnival, Insane Carnival, Barefoot, Dumztree Carnival, Misfitz Carnival, and Xklusive Carnival. 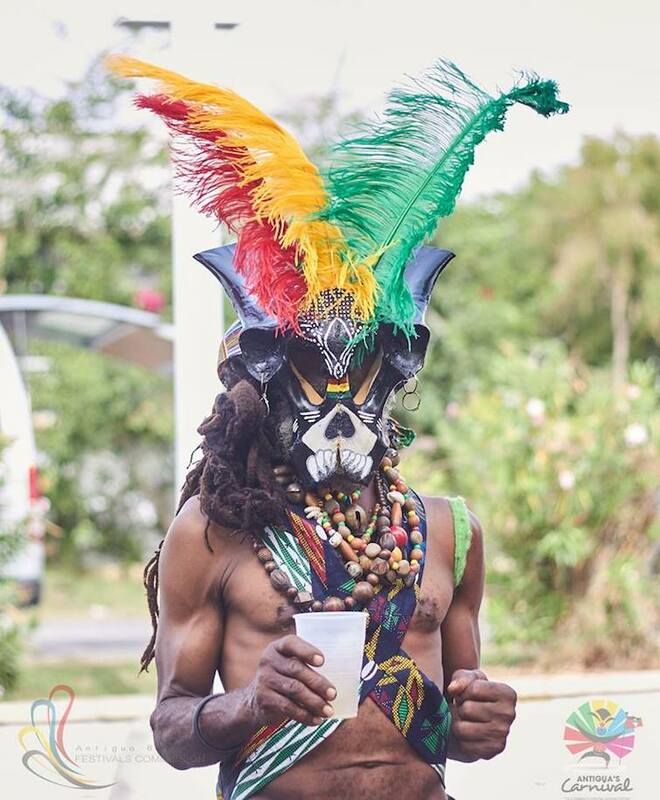 Participating in Antigua Carnival Monday and Tuesday with full costume would be the ultimate, or visitors can test the waters by participating in Jou’vert or T-Shirt Mas. As warm up to Antigua Carnival Monday and Tuesday, there is a J’ouvert event which symbolizes the emancipation of slavery dating back to 1834 in Antigua & Barbuda. 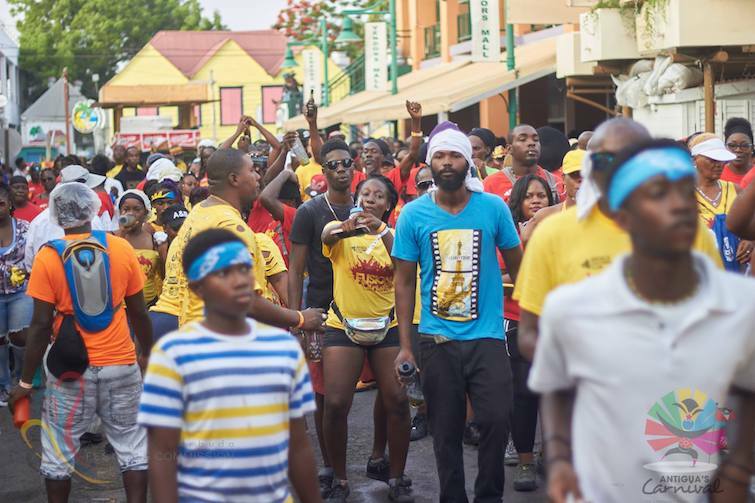 J’ouvert starts early in the morning – around 3 am to 10 am with thousands of revelers taking to the street to follow trucks with live bands or sound systems to jump-up, dance and celebrate. Some J’ouvert mas band not only provide music but also an all-inclusive J’ouvert experience with t-shirt, paint, powder, food, and drink. Antigua Carnival: Each year, thousands of people flood the city streets to celebrate J’ouvert. Photo Credit: © Antigua Barbuda Festival Commission. T-Shirt mas bands are quite common in most Caribbean carnivals, but Antigua Carnival is the only one that has an entire parade just for T-Shirt mas bands. 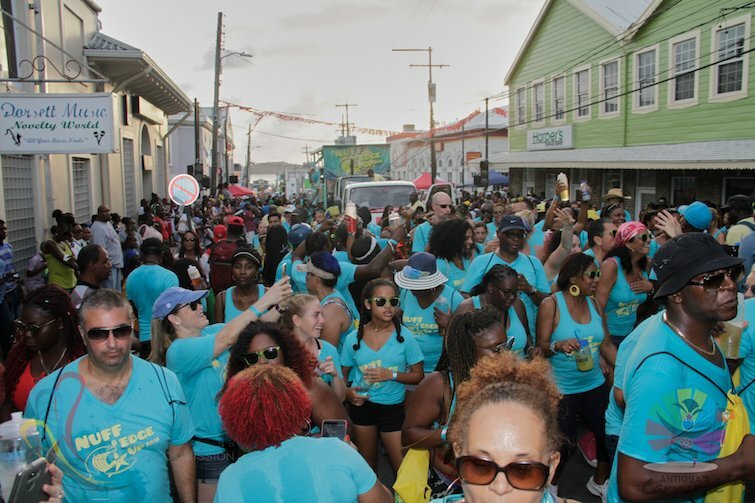 So instead of elaborate traditional or modern feather costumes, the only requirement for those who take part in the parade which goes through the streets of St John’s is a troupe T-shirt. The T-shirt mas bands are not just colorful but also fashionable, and many women modify their T-shirts to make bikinis, dresses, and rompers. Some men also alter their T-shirts though the designs are not as elaborate. To find a mas band to participate with, check out the Antigua Carnival website. T-shirt Mas is unique to Antigua Carnival attracting over 18,000 masqueraders annually. Photo Credit: © Antigua Barbuda Festival Commission. 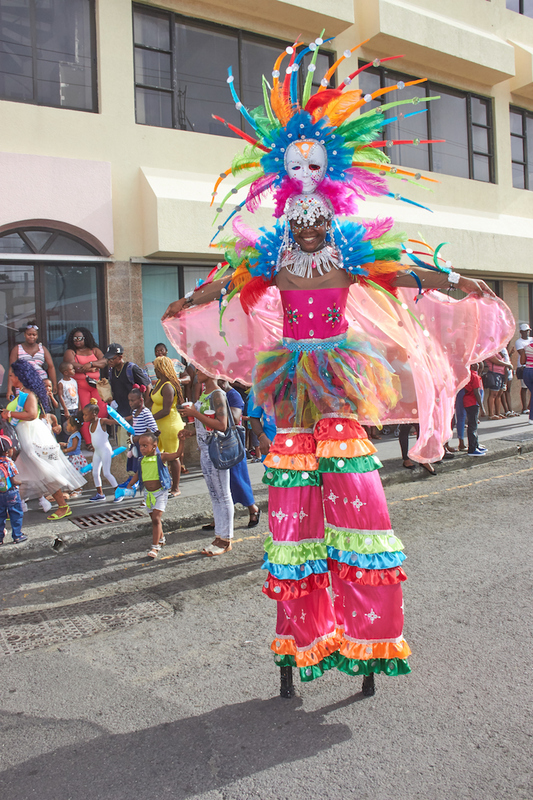 The parades held on the final Monday and Tuesday are the highlight of Antigua Carnival. On average, between Between 25 and 30 mas troupes and groups participate in the Antigua Carnival parades. 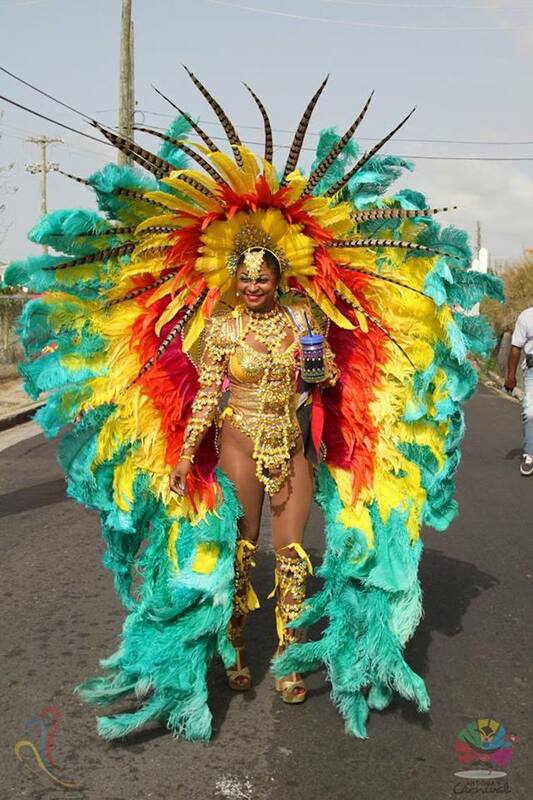 The modern-day feather costumes which are all beautiful get much of the attention, but it is essential to look out for more of the traditional elements of the parades which pay homage to Antigua’s Caribbean and African heritage. Majorettes at Antigua Carnival. Photo Credit: © Antigua Barbuda Festival Commission. John Bull at Antigua Carnival. Photo Credit: © Antigua Barbuda Festival Commission. Stilt walker at Antigua Carnival. Photo Credit: © Antigua Barbuda Festival Commission. Carnival Tuesday, on the other hand, is a more holistic parade which encompasses all of the elements of carnival including floats, steel bands, jam bands, the cultural elements and masqueraders in their full costumes (traditional and party costumes). 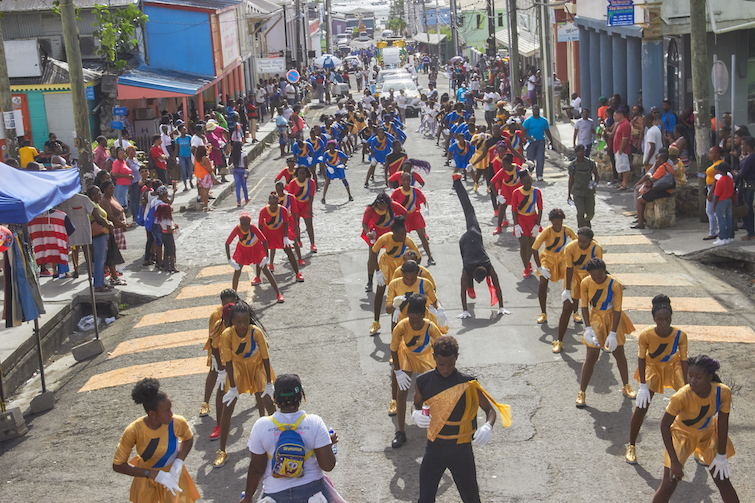 The Carnival Monday parade begins at 2 pm, and the route is close to 1.5 miles through the streets of the capital city of St John’s. 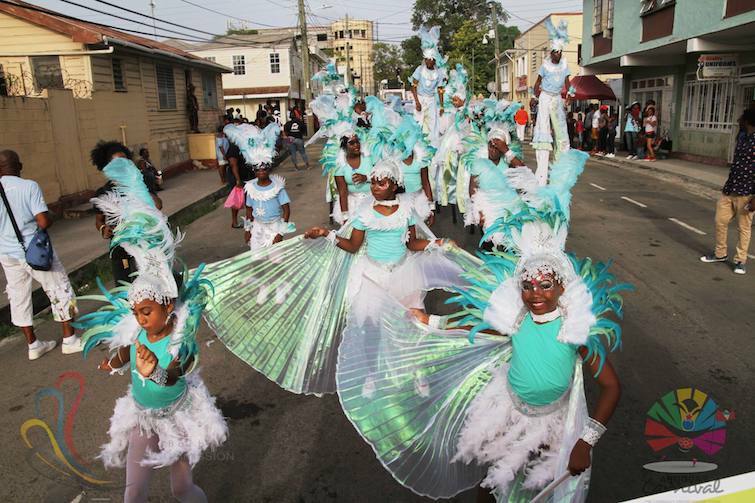 The parade on Carnival Tuesday starts at noon and is a little longer, approximately two miles, also through the streets of St. John’s. A group of pretty ladies in costume at Antigua Carnival. Photo Credit: © Antigua Barbuda Festival Commission. Antigua Carnival: Carnival Men on display during the Tuesday’s Parade of the Bands. 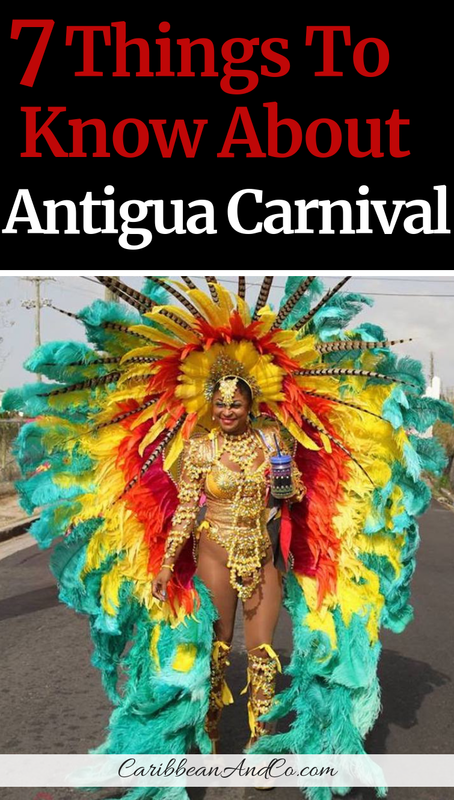 SN Travel is also able to offer an Antigua Carnival vacation package with departure from other airports and staying at a different Antigua hotel, but the prices will no doubt vary. So get in touch with SN Travel for a quote as Antigua Carnival awaits! With pre-carnival fetes and 13-days of festivities including pageants, musical concerts /competitions, and parades, there is much to see and experience during Antigua Carnival. To get to Antigua, search for flights arriving at the V. C. Bird International Airport (IATA: ANU) located 5miles northeast of St. John’s, the capital of Antigua and Barbuda. From Canada, search for flights to Antigua via CanJet and Air Canada. From within the Caribbean, search for flights to Antigua via LIAT and Caribbean Airlines. From continental Europe, search for flights via Alitalia which has a direct flight from Milan, and Condor Airlines from Frankfurt. From the United States, search for flights to Antigua via Delta, US Airways, United Airlines, WestJet and JetBlue. From the United Kingdom, consider flights with British Airways which has daily flights from London Gatwick to Antigua. Or you can search for flights via fly to Virgin Atlantic who flight to Antigua three times a week from London Gatwick, on Wednesdays, Fridays, and Saturdays. For more information on visiting Antigua & Barbuda, check out the official tourism website.